110 years. Scarcely any other luxury car brand can look back on as long a tradition as Bugatti. The French hyper sports car manufacturer is celebrating this anniversary with a special edition of the Chiron Sport limited to 20 cars. The new Chiron Sport ‘110 ans Bugatti’ bears the most famous symbol of a proud nation, the French tricolour ‘Le Bleu-Blanc-Rouge’. Its colours decorates the body and interior at several points and harmonises perfectly with the Chiron. The flag originally symbolised the union between monarch and people in the phase of the constitutional monarchy. Since the end of the monarchy, it has represented the French Revolution with its famous ideals of liberty (blue), equality (white) and fraternity (red). The body and the front end are made from carbon fibre and the Bugatti line and the typical Bugatti radiator from aluminium. The matt Steel Blue paintwork at the rear of the car, has a sheen like hot-rolled steel. The typical Bugatti line, the dominant ‘C' surrounding the passenger compartment, is also painted Steel Blue. The front end consists of exposed carbon fibre in Steel Blue Carbon, once again a matt colour suggestive of steel. The two-tone colour scheme is reminiscent of historic models: in the 1920s, this type of paintwork was a sign of luxury and exclusiveness, while it now signals a sporting character and high technological competence. In the case of the Chiron ‘110 ans Bugatti’, the colour scheme divides the bodywork into the monocoque and engine compartment. Behind the alloy wheels painted in ‘Nocturne’ matt black, the bright blue (French Racing Blue) brake calipers are visible. To obtain an immaculate finish, the aluminium filler cap is sandblasted and hand-polished. 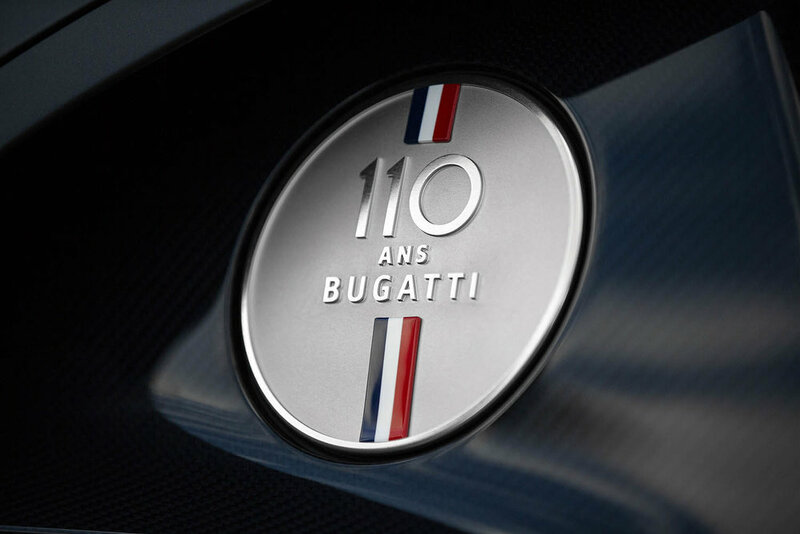 The ‘110 ans Bugatti’ emblem, with the French flag running vertically through the logo, features at the centre of the cap. The rear end is dominated by the diffuser and bumper in glossy Steel Blue Carbon with the contrasting matt black exhaust system. 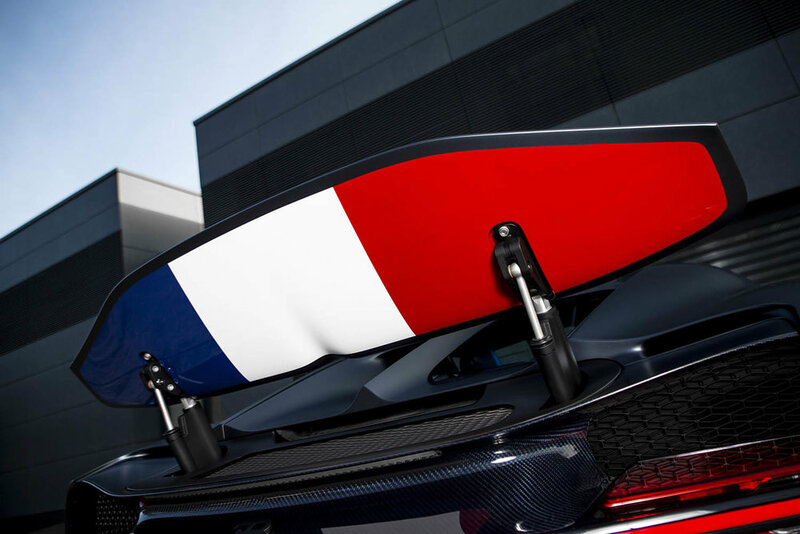 The underside of the rear spoiler boasts the French flag across its entire width. 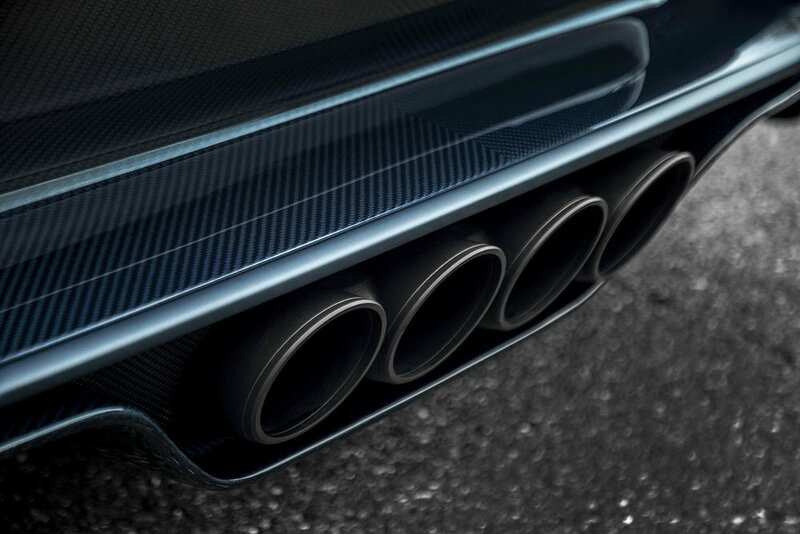 The rear spoiler mechanism is anodised in matt black to harmonise with the matt black Ettore Bugatti logo on the centre of the rear, the matt black wheels and the matching sports exhaust system. The French tricolour also features at several points inside the car. These include the two headrests and the back rests of the sports seats, and the 12 o’clock mark on the leather steering wheel. The sports steering wheel combines matt carbon fibre with a blue leather cover.